U.S. pilots attempted via a communications channel to stop the Russians from bombing U.S.-backed rebels, according to news reports. 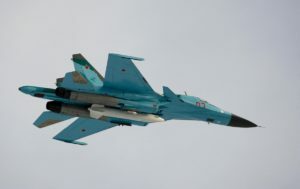 The incident occurred on June 16 when at least two Su-34s, which are among Moscow’s most advanced warplanes, bombed what the Pentagon described as a “border garrison” housing around 200 U.S.-supported rebels in al-Tanf, Syria near the Jordan border. The rebels, members of the New Syrian Army (NSA), were “conducting counter-ISIL operations in the area,” the Pentagon said on June 18. The U.S. Navy scrambled F/A-18 fighters to intercept the Russians, the Los Angeles Times reported, adding that the American pilots are said to have spoken directly to the Russian pilots. “Pilots can communicate with one another on a communications channel set up to avoid air accidents,” U.S. Central Command confirmed in a statement to The Daily Beast. The Russians departed the air space over al-Tanf and a short time later the F/A-18s ran low on fuel and left the area in order to link up with an aerial tanker. Sources said the Su-34s then returned to al-Tanf and bombed the rebels again, killing first-responders assisting survivors of the first bombing run. Russia claimed on June 19 that the location given by the U.S. did not match what was on the ground. “The Russian side explained that the target that was bombed is 300 kilometers from the area identified by the Americans as the location of Syrian opposition groups participating in the ceasefire,” said Maj. Gen. Igor Konashenkov, a Russian military spokesman. Khaled al-Hammad, one of the NSA’s founders, said on June 17 that the Russian attack at al-Tanf killed two and wounded 18. “We do not think they (United States) are serious about us and that is why the Russians bomb us,” al-Hammad said. “Because they know the U.S. will not come to our defense, like they do with the YPG and SDF,” he said, referring to a the Kurdish-dominated force that Washington has preferred to lead the anti-ISIL fight in northern Syria. The NSA is largely made up of defected Syrian special forces and is reportedly equipped with state-of-the-art U.S. weaponry. The Pentagon has also based M142 high-mobility artillery rocket systems in Jordan to protect the group’s al-Tanf based. Russia-U.S. tensions were inflamed on June 17 when news broke of an an internal document in which dozens of U.S. State Department employees called for military action against Syrian President Bashar Assad’s forces.